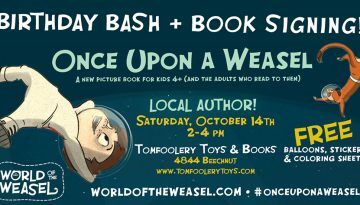 Join Once Upon a Weasel co-author and Houston native Salvo Lavis for a special birthday party for kids affected by Hurricane Harvey flooding in Houston. 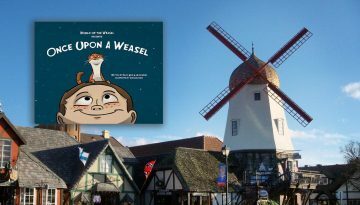 We had a great Saturday signing copies of Once Upon a Weasel at Book Loft in Solvang, California! 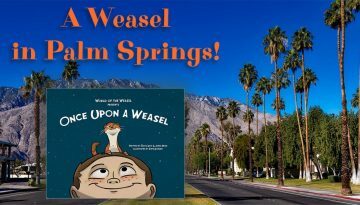 Once Upon a Weasel authors Salvo Lavis and James Munn and illustrator Dave Leonard will be at a Palm Springs toy store for a signing and sale on April 15th! 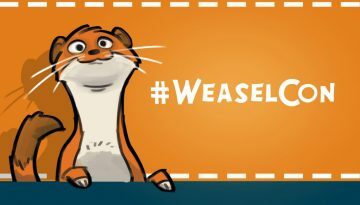 Salvo, James, and Dave—the creative team behind Once Upon a Weasel—will talk about their creative process with kids on Saturday, May 6 at Kidspace Children’s Museum in Pasadena, CA. We had a booth at WonderCon 2017 in Anaheim at the beginning of April. The sister event of San Diego’s Comic-Con, WonderCon features books, animation, comics, authors, and illustrators from around the world. It Was a Miracle (Mile Launch Party)! Thank you to all our friends, old and new, who joined us for the Once Upon a Weasel launch party at Miracle Mile Toys and Games in Los Angeles this past weekend! It was a wonderful way to kick off the World of the Weasel book series and meet great people. 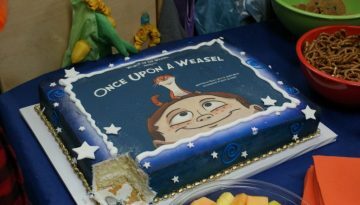 ONCE UPON A WEASEL Launch Party in Los Angeles! Join Once Upon a Weasel authors Salvo Lavis and James Munn and illustrator Dave Leonard at the wonderful Miracle Mile Toys & Games in Los Angeles for the official book launch party! 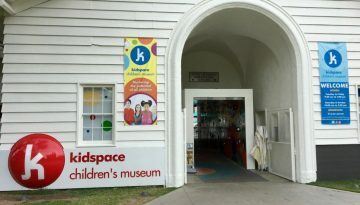 Houston, we have a book fair! 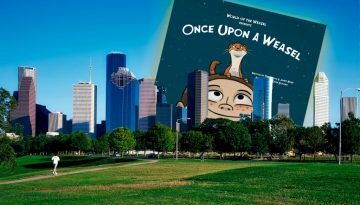 We’re excited to announce that Once Upon a Weasel will be on sale at Oliver Lapin Family Day at the Houston JCC Book Fair on November 6!